'Arguably the prettiest village in England'. Old Drift House is set in the picturesque medieval village of Kersey in the heart of the Suffolk countryside not far from the beautiful and unspoilt Suffolk coast. Kersey is one of England's chocolate box villages with a lovely hilltop church, beautiful thatched cottages, an ancient ford running through the centre of the village, and a traditional English pub. With miles of quiet country lanes all around and several public houses within walking distance it is ideally placed for walkers, cyclists and country lovers. Long before Shakespeare's time Kersey was famous for Kersey Cloth which made the village prosperous. You'll notice the large first floor windows as you take a stroll around the village, which were to give as much light to the weavers as possible. The ford or splash as the locals call it, is actually a tributary of the River Brett which flows through Hadleigh. It's a lovely spot in the summer and great for children who can paddle or feed the ducks. See if you can spot the fox's tail hanging outside one of the cottages to indicate the vet in olden times. Nearby historic market town with quirky independent shops & cafes. Hadleigh is only 2 miles from Kersey and has all the amenities one could want. It has a large supermarket, several tea shops, takeaways, banks, pubs, flower shops, local delicacies, and a swimming pool. Partridges in the centre of town is an old fashioned hardware store that sells almost everything and is well worth a browse. Hadleigh was traditionally a market town and its long High Street contains examples of almost every style of Suffolk domestic buildings. Medieval, Tudor, Georgian - you name it they've got it! Visit on a Saturday morning or market day (Friday) to experience the unique atmosphere of an English market town. The church was built in the 14th century and has a medieval wood and lead spire. Just above the clock the exterior bell, made in the late 11th century, doubles as a clock bell and sanctus bell. The Guildhall is to the left, on the other side of the church yard, and Hadleigh Hall is just round the church to the right. 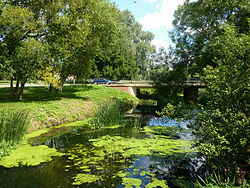 The River Brett meanders its way from the North edge of the town, parallel to the High Street, under picturesque Toppesfield Bridge, through a mill pool and then on to Higham where it joins the River Stour in Constable country. There is an excellent circular walk that takes in the high street and a nature reserve in just 30 minutes. Other local tourist attractions include Lavenham, Sudbury, Long Melford and Woodbridge. Village famous for its rambling medieval buildings & exceptional fine dining. Inspirational location for Harry Potter's Deathly Hallows. Lavenham is one of several wool towns in South Suffolk and is well known as one of the best preserved medieval towns in the country. The town has a rich past and from the 14th to the 16th century flourished as one of the foremost wool and cloth making centres in England, famed in particular for its blue broadcloth. The buildings and church are testament to this wealth and the town´s appearance remains relatively untouched by time. Perhaps the most famous of the wool towns, Lavenham once enjoyed such a high standing that in the reign of Henry VIII it was ranked as the fourteenth wealthiest town in England. For at least 500 years, the manufacture of various kinds of cloth and the preparation of wool and yarn were the main source of this wealth. The appearance of the town has changed little over the years: half-timbered houses lean crazily over the narrow streets while the Guildhall, built in 1529, is perhaps the most prominent feature. The building is owned by the National Trust and open to the public. It stands on one side of the market place, a triangular space surrounded almost entirely by timber-framed buildings. Lavenham has been described as: ´the finest medieval town in England´ and it has no fewer than 300 of its buildings listed as being of architectural or historic interest. One of these is the Church of St Peter and St Paul, which is among the finest in East Anglia - a magnificent church with a spire of 141 feet. Much recommended is a walk along the disused railway line, followed by a wander through the gift and antique shops and a cream tea, lunch or dinner in one of the many fabulous tea rooms, pubs and restaurants. Visit Thomas Gainsborough's birthplace, take a boat trip on the Stour and indulge in a cream tea at The Granary. Only 11 Miles from Kersey, set in the heart of the Stour Valley, the market town of Sudbury was for centuries a centre of the weaving and silk industries. The painter Thomas Gainsborough was born here, and a fine collection of his paintings can be seen in his house, which also has a contemporary art gallery and a print workshop offering summer courses. The Quay theatre puts on a lively programme of events and nearby visitors can enjoy a lazy boat trip on the River Stour followed by a cream tea at the restored 18th century granary. Visitors will need plenty of time to explore this ancient market town; there is still a traditional market on Thursdays and Saturdays, a farmers´ market on the last Friday of each month plus a lovely range of shops to explore. Tea shops, restaurants and pubs are plentiful and for something a bit different, there are boat trips on the River Stour and cream teas at The Granary on summer Sundays. Next to The Granary is The Quay - an intimate, atmospheric theatre in a building dating from 1792 which used to be the town´s grain warehouse. The Quay has a lively programme of events and has also recently started showing films. For the more energetic visitors, The Riverside Walk and water meadows offer an opportunity for a relaxing change of scenery. Referred to as 'the antique capital of Suffolk' with 3 miles of shops to keep you busy. Visit National Trust Melford Hall, and the Tudor re-enactments at Kentwell Hall. Only 13 miles from Kersey this former wool town is perhaps the ´Antiques Capital of Suffolk´. Its wide, tree-lined High Street is full of antique shops and centres. In addition to a wonderful selection of antiques shops, Long Melford has one of the most spectacular churches in the country, dating from the 15th century, and two magnificent stately homes open to the public. Melford Hall, owned by the National Trust, is a turreted brick Tudor mansion, little changed since 1578, with an originalpanelled banqueting hall. It also includes an 18th century drawing room and Regency library, garden and park walk. Kentwell Hall is a Tudor property with a magnificent moat, dating back to the 15th century. You can visit the hall, bakery, dairy, walled garden, brick-paved mosaic and rare breeds farm. Long Melford´s links with the antiques industry are further enhanced with the connection of the long running popular BBC Television programme ´Lovejoy´. With its antique shops, picturesque village green, stately homes and countryside charm Long Melford is a part of Suffolk that is well worth a visit. Victorian kiss-me-quick beachside town with long beaches, promenade and arcades. "Garden Resort Of the East Coast", you will find four miles of beach, a local museum, historic fort, nature reserve & Leisure Centre on the seafront. Edwardian resort, retaining much of its original charm, with beautiful south facing gardens, paved promenade, leisure centre, pier and theatre. Its popularity began with the arrival of the railway in 1887, and a visit in 1891 by the Empress of Germany. The docks, Britain´s leading cargo and container port, were developed on marshland in 1886. Coastal path walks, fresh fish stalls, and passenger ferry to Bawdsey. Best place for crabbing. Also worth a visit for a wander along the beach path or along the beach, to go crabbing on the jetty with the children or just watch the others doing it, to have tea or fish and chips in the old fashioned café, or to browse the art and gift shops. This large town is a hive of activity with hIgh street shopping, theatre, cinema, swimming pool and vibrant nightlife. If you fancy the hustle and bustle of a big town then visit Ipswich. It has all the high street stores you could wish for, a swimmingpool, theatre, cinema complex, great nightlife and much much more. Ipswich is England´s oldest continuously settled Anglo´Saxon town and has medieval streets and architectural gems to charm everyone. Twelve medieval churches stand testimony to the importance of the town as it developed in the Middle Ages. Then there are the wide green open spaces - Christchurch Park with its Tudor mansion in the town centre, Holywells and Chantry parks and the verdant beauty of the Orwell Country Park with its stunning views of the Orwell estuary. Unique historic gem with museums, galleries, cathedral and abbey. Home to an award winning market and Britain´s smallest pub ´The Nutshell'. The town grew up around the powerful Abbey of St Edmund in early medieval times. For five centuries it was visited by pilgrims from all over the world, coming to worship at the shrine of St Edmunds - the martyred King of East Anglia. Taking a stroll around the centre of Bury is an interesting experience. Fine facades reveal a wide range of unusual, independent shops offering traditional service and endless inspiration. The twice weekly provisions market is a social event as well as a shopper´s delight, and the dozens of cafes, restaurants and pubs offer the visitor endless choice of refreshments. In the summer the town becomes a riot of colour with flowers cascading from window boxes and hanging baskets. Small wonder that the town has won so many awards for floral excellence. Bury St Edmunds boasts many attractions including Museums, Galleries, a Catherdal, and Britain´s smallest pub ´The Nutshell´. Visit Moyes Hall our local history museum, housed in one of England´s few surviving Norman houses. Inside is a fine selction of unsavoury items such as man-traps and stone coffins. By contrast Manor House museum offers a peaceful interlude in a fine Georgian Mansion. Collections of costumes, art, and horology are displayed in these wonderful surroundings. The third museum is Greene Kings Brewery Museum. The museum´s storyborads, illustrations and artefacts provide great insight into the history and art of brewing the the town. St Edmundsbury Cathedral built by Abbot Anselm in the 12th century and The Art Gallery are worth a visit. The Gallery was designed by Robert Adam and is popular with lovers of art and architecture alike. The gallery runs a programme of nationally important exhibitions throughout the year. The Theatre Royal is one of the oldest working theatres in the country and one of the few surviving Georgian Playhouses. A thriving programme throughout the year, including many Festival events in May. World renowned Suffolk coastal town with fantastic photo opportunities at every turn. Charming and sedate seaside town, which grew from an old medieval fishing and shipbuilding centre. The wide High Street has attractive Georgian shop-fronts. Historic buildings include the Moot Hall (c. 1520) and the 15th C. church. Fishermen still pull their boats onto the steep shingle beach, and sell their catch each morning. The famous music festival is held in June. Snape Maltings is a unique collection of granaries and malthouses nestling beside the River Alde. Shops, galleries, restaurants and the world class concert hall fill the old buildings. There are a number of events taking place at the Maltings including river trips, farmers markets, exhibitions and guided river walks.